TESD, standing for Transposable Element Simulator Dynamics, is a scientific application developed by the Laboratoire de Biométrie et Biologie Evolutive (UMR CNRS 5558, Université Claude Bernard Lyon 1, France). Based on " The dynamics of transposable elements in structured populations", Deceliere et al. (Genetics 2005, 169: 467-474) have developed the simulation core of TESD in an object-oriented fashion. TESD simulates the number of genomic TE copies in different populations across generations (according to the Island Model), using classical models of TE dynamics. The parameters of the models (transposition and excision rates, selection intensity, recombination rate, migration rate, population sizes and number of populations) are defined by the users. To make it more user-friendly, TESD has a graphical interface. Users can set the various parameter values by using forms that ask questions. The results of the simulations are visualized thanks to built-in graphical tools, using the JFreeChart library. TESD provides a complete application that allows modellers to implement other models of TE dynamics. 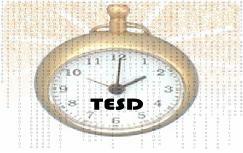 TESD is implemented in Java, an object-oriented language that can be extended easily, and this means that TESD can be run on all Operating Systems (Linux, Mac, Windows, Solaris, etc.). TESD can also be used via a command line interface instead of the graphical one. This can be useful for experienced users planning, for example, to embed TESD in a script or to study its outputs with R. See the Help Files for more details. The Help Content of TESD can be downloaded here. TESD sources can be downloaded here. You are free to change the sources of TESD. TESD was developed by Gregory Deceliere and Yann Letrillard at the Genomes & Populations team of Christian Biémont at the Laboratoire de Biologie et Biométrie Evolutive (UMR CNRS 5558, Université Claude Bernard Lyon 1, Villeurbanne, France). If you encounter any problems or have any questions when using or developing TESD, please contact Christian Biémont.